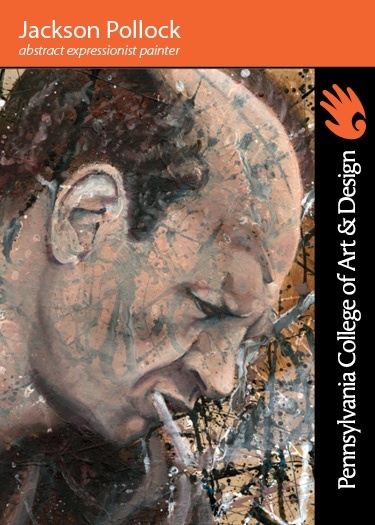 Jackson Pollock (1912-1956), an American painter from Wyoming and pioneer of the Abstract Expressionist movement. His family moved throughout the western United States, and Pollock, influenced by his older brother, also an artist, attended the Manual Arts High School, Los Angeles. Moving to New York in 1929, he studied at the Art Students' League, New York, under Thomas Hart Benton. 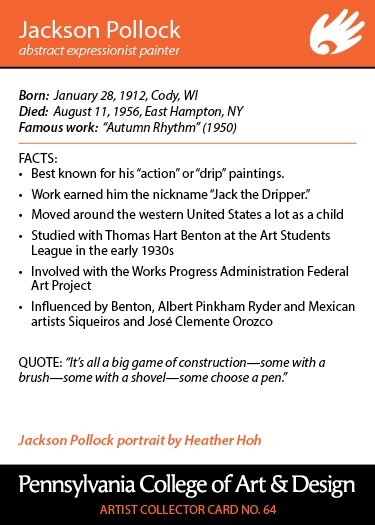 During the Depression, he worked for the Federal Art Project’s mural project resulting in numerous works by the artist. By the mid-1940s he was painting in a entirely abstract manner, and his famous `drip and splash' style, pouring and dripping paint onto his canvas on the floor, began in 1947. Pollock also introduced the All-over style of painting, where there is no focal point to a work in relation to the canvass. These two characteristics helped mature the new American painting in the 1940s and 1950s. An article in Life Magazine in 1949 changed Pollock’s life abruptly when it asked, "Is he the greatest living painter in the United States?" His style was not always understood and in 1956 Time magazine called him `Jack the Dripper'. In 1944 Pollock married Lee Krasner (1911-84), who was also a well-known Abstract Expressionist painter. Frequently, however, his life was marred by alcoholism, and this led to his accidental death in 1956. Since the 1960s, he has been considered an innovator and trailblazer in this important movement of American Abstract Expressionist painting.